Transport chiefs behind Leeds' planned trolleybus system say it may increase congestion in parts of the city. Costing £250m, the New Generation Transport (NGT) network will link park and ride sites at the north and south edge of Leeds with the city centre. Dave Haskins, project director, said it was not a "silver bullet" for all of Leeds' transport problems. Leeds is the first UK city to get a modern trolleybus. It will be in place by 2018 subject to a public inquiry. 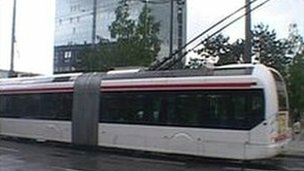 Mr Haskins, head of the trolleybus project for West Yorkshire public transport provider Metro, said the scheme was not a "congestion buster". He said: "It's hard at this stage to say whether congestion will be higher or lower as a result of the scheme. Electric power "It's clear that it will significantly improve bus and transport journeys on the corridors that we are putting it in but we are looking at plans elsewhere across all of Leeds where we can implement other public transport and highways schemes that will improve people's journeys." Doug Kemp, from West Park Residents' Association, said the trolleybus would create more traffic problems in Headingley. "You're still going to have buses running through the centre of Headingley and now you're going to have cars going through there that are having to crawl through because of priorities being given to the trolleybus, that means greater congestion." Plans for the city's £250m scheme, which were first discussed in 2007, have been approved by Transport Secretary Justine Greening. The Department for Transport will pay £173.5m towards the scheme, with the rest coming from local authorities.